2" wide designed to fit 700c or 27" wheel sizes. Made from red Oak with a simple center stripe of Walnut and finished in satin. Comes with all mounting hardware. Designed to fit 700c wheel sizes. These are 1 3/4" wide so a tire size of up to 42c. 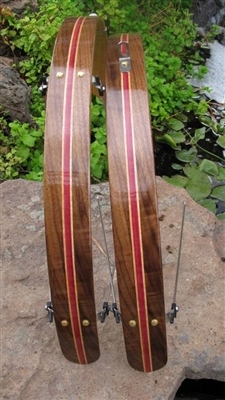 Made from super figured honey colored Leopard wood- these go great with any of the honey colored Brooks products. Finished in satin. 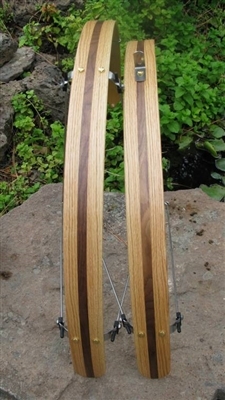 Ready to ship- Walnut with Purpleheart center 26"
2 1/4" wide designed for 26" wheel sizes. Made out of nicely figured Walnut with a wide center band of Purple heart flanked by two thin lines of Oak. 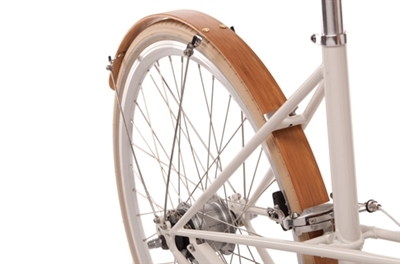 Fenders come with all mounting hardware. Finished in gloss. 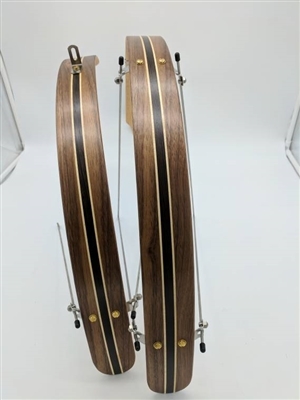 Ready to ship- Walnut with Wenge stripe 26"
One of the all time best selling fender patterns ever. These are built up and ready for Christmas! Made from dark Walnut with a black stripe of Wenge wood flanked by two thin lines of Maple. Designed to fit 26" wheel sizes. 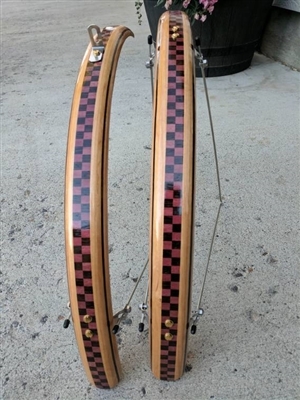 2 1/4" wide measured across the width of the fender- the perfect size for cruiser bikes! 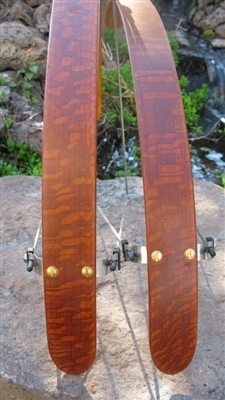 Fenders come complete as a set of both front and rear with all mounting hardware.